Jack Horner dreamed of becoming a paleontologist and of making contributions that would help our understanding of dinosaurs as living creatures. Because of his poor grades Horner knew that achieving this goal by getting a Ph.D. would be close to impossible. However; he held tight to his dreams, and followed his own path to success, and now directs his own research projects and teaches undergraduate and graduate students. His work has been honored with a MacArthur “Genius” Award, and when Steven Spielberg needed an advisor for his Jurassic Park films, he came to Horner. 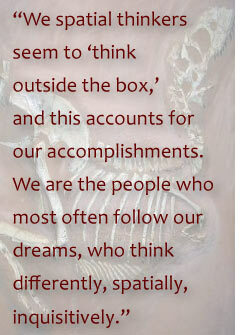 Jack Horner turned a childhood passion for fossil hunting into a career as a world-renowned paleontologist. During the mid-1970s, Horner and a colleague discovered in Montana the first dinosaur eggs and embryos ever found in the Western Hemisphere. Their findings provided the first known evidence of nesting and parental care among dinosaurs. Horner continues to be on the cutting edge of research on the evolution and ecology of dinosaurs. He is the Regents Professor of Paleontology in the Honors College at Montana State University (MSU) and the curator of paleontology at the university’s Museum of the Rockies, which is home to one of the largest dinosaur collections in the country and the largest Tyrannosaurus rex collection in the world. Horner, who holds honorary doctorates from MSU and Pennsylvania State University, was also the recipient of a MacArthur Fellowship, known as a “genius grant.” The author or co-author of eight books and about 150 professional papers and articles, he has been featured in numerous magazine articles and television specials and served as a technical adviser for the Jurassic Park films, which based one of their main characters on him. To get to where he is now, Horner had to follow a tough road. As a boy in Shelby, Montana, he was shy and introverted and played by himself “all the time,” he says. He describes school as “difficult, because everybody called me dumb, but I knew very early on that I could do things other students couldn’t do.” A recent article he wrote called “An Intellectual Autobiography” describes his grade-school experiences as “extremely difficult because my progress in reading, writing, and mathematics was excruciatingly slow.” Horner’s salvation was his fascination with building things and his ability to produce outstanding science projects. His mother encouraged his projects as a way to boost her son’s confidence by doing what he was good at, and her support translated into award-winning projects at science fairs throughout high school. Among the projects were a rocket that soared to a height of several thousand feet; a Van de Graff generator; and a tesla coil, for producing high-voltage electric arcs. His senior project, an exhibit comparing the fossils of Montana with those of Alberta, Canada, took top honors at the state fair and garnered a recommendation from one of the judges, who was also a University of Montana professor, that Horner enroll at his university. Although he graduated with a D average, all that was required to attend college then was a high school degree, Horner enrolled at the U of M in the fall of 1964 and planned to major in geology. In 1965, he flunked out of college and was drafted by the Marines to work in reconnaissance in Vietnam. He served for two years, including 14 months in the area of the demilitarized zone, before returning to his studies at the university. Though Horner failed five successive quarters, he was fortunate to have the support of an adviser who, he says, “believed I wasn’t lazy or retarded, and he wrote letters of support for my quarterly returns to school.” During this time, Horner took all the geology and zoology classes that related to paleontology, as well as courses in archaeology and microbiology. He even studied English, briefly and unsuccessfully. Horner finally abandoned his quest for a degree and left the university in 1972, believing he was “as good a geologist and paleontologist as any other student at the doctoral level.” He had also completed a research paper on the geology and paleontology of a stratum in Central Montana containing 300-million-year-old fish and later published three professional papers based on his research. Despite his academic failures, Horner held tight to his dreams, which he knew he could fulfill if allowed to follow his own path. “My goal in life was simple: I wanted to be a dinosaur paleontologist and make some kind of contribution to the field of paleontology that would help our understanding of dinosaurs as living creatures. To accomplish this, I knew I needed a job in a museum, but I also realized that with my college grades and no degree, I might never get such a job.” While eking out a living driving an 18-wheeler, he applied for work at “every museum in the English-speaking world” and was accepted by three: the Los Angeles County Museum, the Royal Ontario Museum in Toronto, and Princeton University’s Natural History Museum. “I made my decision not on the basis of rank or pay, but on where I’d rather live,” says Horner. “I decided that Los Angeles and Toronto were too large for my taste, and that Princeton would be perfect, even though it was the lowest-paying job.” Working as a technician with the museum director on research projects and exhibitions, he was soon promoted to research assistant and eventually managed his own research projects, with funding from the National Science Foundation. Horner wrote his own grant applications and was considered a full member of the paleontological research faculty; he just couldn’t sign the applications because he didn’t have a PhD. Ann Bancroft’s life is distinguished by the number of firsts she has achieved. In 1986, she became the first woman in history to cross the ice to the North Pole, traveling 1,000 miles by dogsled from Canada’s Northwest Territories.